St. Scholastica's School of Nursing has received about $440,000 in new grant funding to continue two programs that are addressing the shortage of healthcare professionals in rural areas. 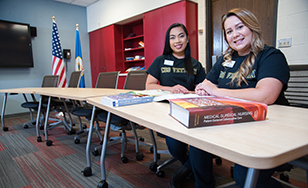 St. Scholastica received a fourth year of funding to continue its Implementation of a Nursing Veterans' Initiative to Transform Education (INVITE) program, which prepares veteran nursing students for careers in rural areas. The College received a grant of $280,600 for the INVITE program. Separately, St. Scholastica also received $163,358 to support its Rural Academic Practice Partnership (RAPP) for Northeastern Minnesota. Both grants come from the U.S. Department of Health and Human Services Health Resources and Services Administration. The INVITE program promotes the recruitment, enrollment, retention, graduation and placement of veterans seeking a bachelor of science degree in nursing. Participating students will take part in a variety of clinical experiences and interact with veteran nurses at VA hospitals, clinics, and other facilities. Since it started admitting students in Spring 2016, the program has successfully met its objectives and exceeded its enrollment goals. "We are so pleased to have received another year of funding to help us continue the important initiatives we started through the INVITE program," said Dr. Paula Byrne, assistant professor of Nursing and INVITE project coordinator. "This is a major vote of confidence in our efforts by federal officials. The grant will support the continued delivery, evaluation, and refinement of the School of Nursing's Bachelor of Science program for rural veterans." During the fourth year of the program, Byrne said, the INVITE model will continue to provide a cohort of veteran nursing students with interaction with veteran nursing faculty members, non-veteran nursing faculty who have received relevant training in military culture, veteran peers majoring in nursing, and practicing veteran RNs. Goals will include recruiting students from area minority communities with a focus on tribal populations. The funding will support the INVITE program through June 30, 2019. Meanwhile, the School of Nursing also received a new grant for its RAPP program, a collaboration with Essentia Health to strengthen the preparation and increase the numbers of advanced practice nurses in rural and under-served areas. The funding will be used for developing additional primary care Advanced Practice Registered Nurse training curriculum, with a special focus around mental health, substance use disorders, access and treatment, proper pain management, and proper opioid use.